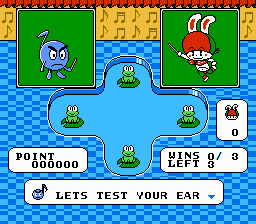 Pyokotan no Dai Meiro is an action game for the Nintendo Entertainment System. 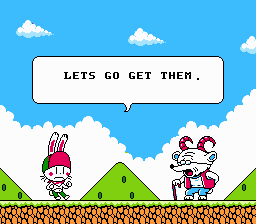 Here is a full English translation for the game Pyokotan no Daimeiro. Everything has completely translated. 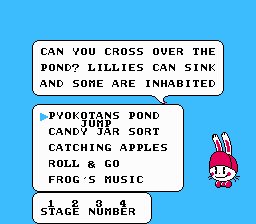 Update from V0.99 to V1.0 - Proveaux corrected the issues with the level names on the pause screens, reorganization and color mishaps on the title screen, a missing dialogue sentence, and changed the pond game name to fit better in the mini-game selection menu. Guyver (X.B.M.) 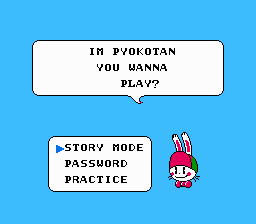 Original Hacking Usage of his code on Russian translation for expanded dialogue boxes. Jink640 Translation Stage End & Spot translation. Grimwulf Translation Minigame dialogue and in game dialogue translation. Translation Beginning Menu Translations & Introduction. 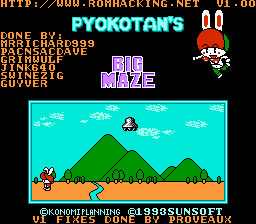 Proveaux Hacking V1 Fixes and hacking improvements.